After my previous post entitled Taste the Rainbow the planets have aligned to give me material for a follow up called Taste the Tube. The Daily Telegraph recently reported the case of James Wannerton who has synaesthesia and claims to be able to ''taste" all of London Underground's stations differently and distinctly. See also Gizmodo. Mr Wannerton's condition leads his senses to become muddled so he experiences the sense of taste in relation to what he sees. And this is the map. At first I was very dismissive of this latest example of what I call "Becksploitation" (the art of using Beck's famous map in a lazy, crude manner to hang your own ideas off and short-cut to high visibility and distribution). But there's no reason to suspect Mr Wannerton's condition isn't valid and in that sense (no pun intended) this map reflects a very personal geography that he experiences. Soundscapes and smellscapes are often mapped so why not tastescapes. While it is bizarre, why shouldn't the stations take on a different name that he relates more logically to? 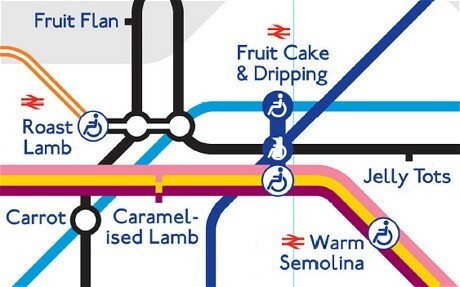 When I regularly used the tube my daily route took me from Roast Lamb, through Raw Carrot, Sausage Meat, Sausage and Fried Egg, Curly Wurly, Apple Pie, Mint Cracknell and Fizzy Water. Odd...because all I used to smell was sweaty armpit, putrid perfume, stale smoker's breath, fast food and urine. In much the same way as my pet carto-peeve is non-normalised choropleths, my carto pal Anthony Robinson (@A_C_Robinson)'s is rainbow coloured maps. 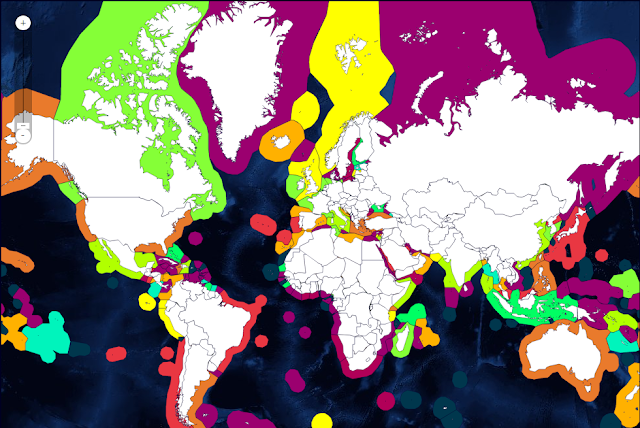 More specifically, rainbow colour schemes on thematic maps. "Rainbows kill people so stop using them on maps". 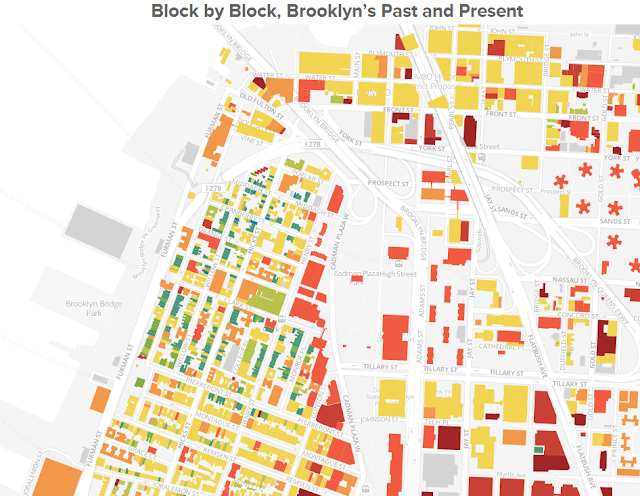 Here's a map from BKLYNR where they've mapped Block by Block, Brooklynn's Past and Present: the construction date of every building in Brooklynn, new York. No mean feat. Nice bit of data handling and processing. Then they mapped it using rainbows. Pretty map...but based on the above, tell me which are the newer and which are the older properties? Actually you can't do that simple analytical task. The legend helps, of course...but why should blue be old, yellow be turn of the Century and red be new? This is a perfect example of a colour scheme totally wrecking an otherwise perfectly good map. If the author had used a sequential scheme (say blues, light to dark) then we could have at the very least figured out the relative age of buildings across the map. The only difficulty would have been working out which end of the lightness gradient was new or old. 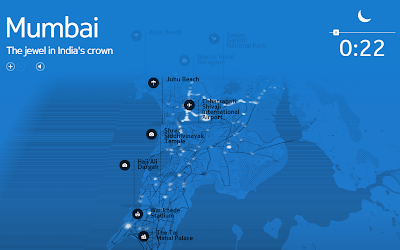 The author states the map can be used to see how development has rippled across a neighbourhood. Actually, you can't do that. At best you can see which buildings are similarly dated but not how one colour relates to another. Let's not worry too much about what this map shows other than we can recognise that different coastal zones are somehow different. But that's actually not the case. 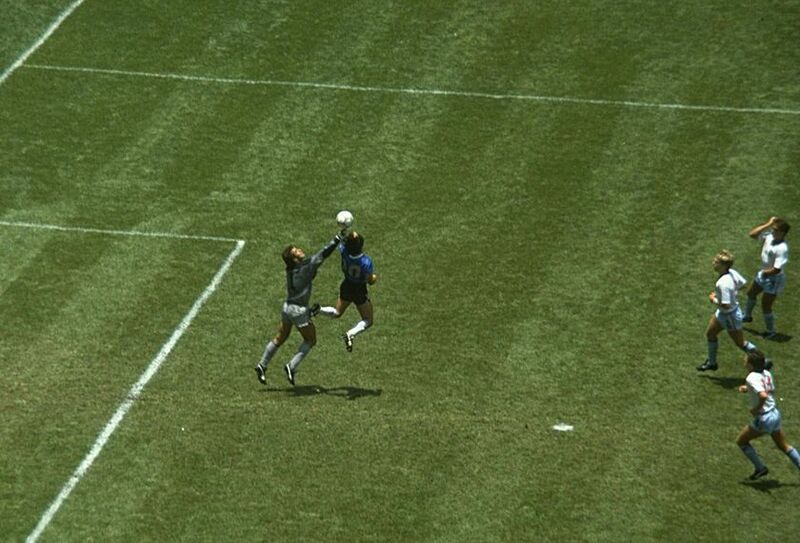 in fact, when you look at the legend you see that they are different in a numerical sense. We're not looking at different phenomena. We're looking at areas that are rated on a percentage scale. The deep plum/reds are low on the scale. Light blues are high on the scale. Yellows again occupy the middle area. Again, a single hue sequential colour scale would work well here. We could instantly see which is relatively higher or lower on the scale. 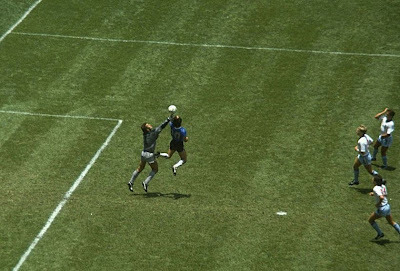 We wouldn't need to refer to the legend. The map wouldn't require sunglasses. And what of the different sized buffers? That is simply an artifact of using Web Mercator. They are, in fact, equal distance buffers around the coastline but of course in the north and south they get distorted on Mercator and that simply gives them greater map real estate and visual prominence. Whether or not rainbows kill people...I'll leave that up to Anthony to comment. They certainly kill maps. There's no doubt that maps that look good are better than maps that look bad and whilst that is, in part, down to subjectivity as technology progresses so we're seeing more better looking maps. They are beautiful (in my opinion). They have a strong aesthetic that pulls you in to explore. They use colour sparingly and they use a palette that works well. The symbology contrasts well and visually I'd describe them as quite stunning...certainly creative and well composed. As we move through time the individual symbols add a trace to the map so we get a cumulative look at general movement corridors and the blue proportional symbols increase in size as people move close by. They're grocery stores. The design isn't wholly original but originality shouldn't always bee seen as the cornerstone of something being 'good' anyway (itoWorld's maps of OpenStreetMap edits set the standard for this type of map style and animation some years ago of course). So they look good and follow on from maps designed in a similar fashion. Job done? Unfortunately, beyond the aesthetics are just dumb maps and there's nothing particularly clever about them....they even put the animation to a soundtrack as with many such maps. The University of Washington's Center for Public Health Nutrition is responsible for them and The Atlantic gives them a short write-ip. Researchers stuck GPS receivers on 493 people in Seattle to watch where they went across a week in order to see what their food buying patterns were. 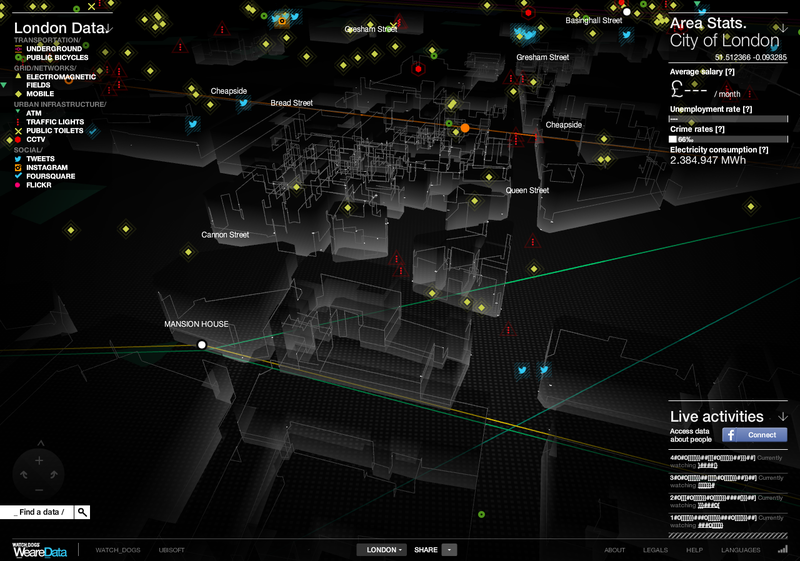 The maps are a first stab at looking at the data and guess what...people move through space. they move in different ways. Some move faster (cars), some slower (feet) and what do the squiggly lines and symbols tell us...err, nothing... people move from here to there as they go about their daily business. The GPS wearers did keep a diary of their movements as well as shopping habits etc so it'll be interesting to see if the researchers can turn that data into something more meaningful and actually reveal something and map it. That's the hard part...turning a research question into a set of digestible findings that can be mapped to reveal them visually. We wait in anticipation but at the moment the maps are just eye candy. The GPS tracks are in no way broken down into trips to grocery shops...it's just raw data. The blue dots get bigger as people move close to a grocery store located there but that would always happen because grocery stores are located in areas that people move close by. People move. Nothing more or less. In their second video they tracked speed of movement. The claim is this highlights the walkable parts of the city...but if you look closely it actually doesn't...it just reveals where people who walk...walked. Is downtown walkable...well it will contain more people at certain times of the day who most likely walk to get lunch. that doesn't mean the urban morphology is any more or less walkable. Correlation does not imply causation. And here's a second map that's doing the rounds as a collaboration between HERE (Navteq and Nokia Maps) and CartoDB. It's called Living Cities. Go take a look by clicking on the image. Again...it's visually very appealing and using CartoDB means they've made the UI really slick and modern. It's certainly pushing web-cartography more towards a higher-quality product and if tools to make web maps begin to provide the ability to design maps like this then that's a really positive move. The basemap is really nicely integrated into the application for instance and uses some clever symbology. But we're still stuck for purpose....dig a little. What does the map actually show? Again, not very much. 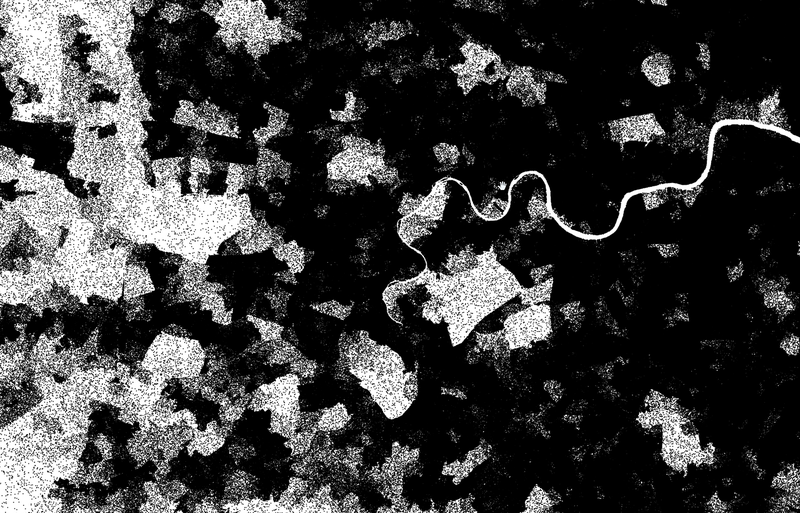 We've got some animated pulses (nothing like visualising the pulse of a city for sure) and factoids popup. There's some clicky things and we have time represented as well. None of this is particularly useful and hundreds of other city maps also take feeds of data and purport to offer insight into daily patterns. They don't...they just show partial, generalised and random picto-bites and sound-bites. This brings me to the general point...should maps always be 'useful'? Well yes...I believe they should but here's the sting: A map's 'use' can be defined purely as an object that is designed simply to look good and bring visual pleasure to a set of data. There is nothing wrong with stating categorically that your map is designed to just look good. Maps can just be artistic with pleasure being derived from their appearance or designed to inspire people to design their maps along similar lines. But...the maps shown here and many, many others go way beyond this simple objective and claim all sorts of nonsense to try and justify their being; to try and purport to show something they have no hope of showing; to raise their standard beyond the purely aesthetic as if they become more valuable by so doing. But in over-selling their purpose they actually do themselves a disservice. The Seattle maps claim to be about exploring movement, behaviour, grocery shopping and health. The Living Cities maps are designed to tell 'stories'...except they don't, really. They look good...that's about it. They are valuable on that basis alone so let's leave it at that. Looking good for the sake of looking good is fine by me...and I like what these maps show. I can look at them, smile, take some ideas and move on....trouble is at the moment it seems people are desperately trying to find a reason to make their own particular pretty map. It's almost as if they are reluctant to simply make a pretty map without having a higher purpose on which to hang their visual ideas. Pretty maps are fine. Pretty maps with a real purpose and which genuinely serve that purpose...now that's the ticket! Hat-tip to @briantimoney for sharing this too-good-to-be-true piece from Business Insider just as I'm about to set off for two weeks of carto-conversation in Germany at the International Cartographic Association conference then the UK at the Society of Cartographer's Summer School and the British Cartographic Societies Symposium. 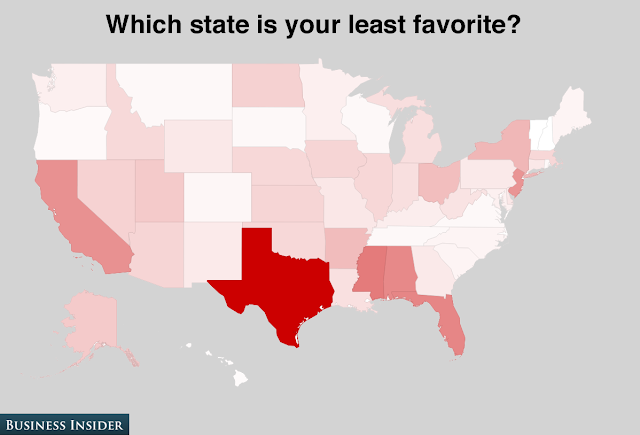 A poll of 1603 people were asked to answer questions about US States that weren't their own and the responses are amazing....actually, it's not the responses that are amazing, it's the fact that someone thought they could fashion any sort of sense out of the results and then map them into meaningless gross generalisations. Yes, that's 22 maps based on a sample that represents 0.000005% of the American population. Were they even representative of the population in socio-economic terms? Were they spread evenly across the 52 States (31 people per State) or was the survey stratified so that more populated States had more respondents? Or was it just a random interweb survey of whomever could be bothered to click through a mundane survey? Were responses based on first-hand knowledge or just stereotypical perceptions? Bad science all round in relation to the survey. And the maps...well, each one is beautifully crafted in Web Mercator (not equal area...which of course creates visual problems) and each has a separate colour (really nice design touch). But wait...there's no legends and we are expected to imply that darker hues mean 'more'. More of what? Totals? yes...yes...they look like totals. Twenty-two non-normalised choropleths in a single article. This has to be some sort of record. I can't be certain because there's no details but I would wager serious wonga on these maps all being totals which of course renders them useless when comparing results across a map. UPDATE: About 24hrs after going live the post had got over 300,000 views, 30,000 Facebook likes, 1700 tweets etc. A week later...690,000 page views. Nice visibility for poor maps! UPDATE 2: The author, Walter Hickey has contacted me with details of the survey. It was stratified so at least there is some sense to the distribution of respondents by State. I'd still claim (or whine as someone mentioned below) that 1400 people is not a particularly good sample. I had to do 1500 surveys for my PhD in a town with a population of 210,000 to get a statistically significant sample. Not sure how 1400 in a population of 310,000,000 can in any way be representative. Regardless, the maps are still wrong so it's a moot point. Here we have a perfect example of one of those self-styled tech-guru web magazines getting all excited about something that looks good without bothering to question it critically. 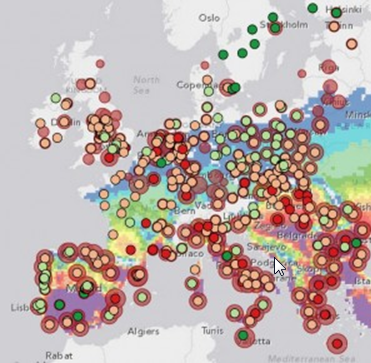 Sure, it looks beautiful (it does..but then so do many of today's s-called viral maps!) but...it's not real-time and that's just the tip of the iceberg. So the author has successfully scraped tfL data. Great. So have many others. He's used his undoubted eye for visual design to create an aesthetically pleasing piece of web-art but how can it offer any practical use beyond being simply web-art? You can't navigate by it. You can't actually see where the interconnections are. You can't use it as a route planner. You can't figure out where stations are without clicking them all. It has a sound track...why do we need a sound track? Soundscapes are valuable but as a component of a map they should be linked to something and not just as an atmospheric backdrop. You can speed up the trains...why? A few quick spins and you have no idea which way is up, down, left or right. Is tube line depth what defines the z information? Apparently so but of course there's some modification in order to accommodate parallel lines and so forth. Web-art yes. A map, no, because it doesn't function as a map. So a Technology focused media company (their words) thinks this is the dogs b*llocks in mapping eh? Great reporting...now, let's go find Mr Beck's old map and see how that compares. Beck's map is beautiful in its own right and actually functions as a map with a purpose. It's a shame that Beck's map continues to be re-worked when it doesn't really need it. Technology is moving fast but how many tech-driven transit maps still struggle to capture and frame the network like Beck? It's also a shame that so many people will read The Next Web's review and believe the hype. This map will likely pop up all over the place over the next few weeks as more media networks find it and blindly promote it. Wouldn't it be refreshing for one of the big guns to offer some critical comment rather than bland kudos. I've spoken/written before of my perception that more maps and more visibility of mapping does not necessarily equate to more quality. There's a tidal wave of tsunami proportions pounding away at the shores of cartography. It's being powered by hundreds (thousands) of map-makers all keen to crack a technological issue, wrangle their big data into a map (data has to be 'big' these days to make your map, well, worth making) and unleash their effort into the milieu. Many people view this as undeniably good for mapping and to an extent I agree because these are certainly empowering, exciting times to be involved in mapping. Those of us (un)fortunate enough to have a reasonably lengthy background have some perspective of where we were 10, 20, 30 years ago (some even longer...no names) and yes, there's no doubt that changes in computing patterns have led to not just an evolution but a revolution in mapping. Pace of change is rapid and each new day brings a new map; and every now and then something comes along that for a few days at least becomes a so-called game-changer. There's a lot of great work being produced but there's far more weak maps being made. There's also a lot of weak maps being made that are promoted as being great. Maps are becoming like anything else. We want more, we want it more rapidly, we want it cheaper and, crucially, we want it via the easiest route possible because people have become lazy. This applies to so much in the societies I am familiar with and, certainly, that society in the cloud. In short...we want fast maps in the same way that as a society we've embraced fast food, cheap clothing, cars and any other commodity we feel enriches our lives but which we can get easily. We rarely want to wait too long or pay too much...and maps that drop in front of our ever-surfing eyes are the easiest of all to consume from whatever feed we pour into our online lives. The Open Source movement has certainly driven change in mapping. Google have been major players too. Many large geo-companies and organisations have also moved with the times and they've had to because if they don't they die and will likely become the next Kodak. Everyone wants a franchise and, in particular, a cloud-based franchise...everyone wants to be the Starbucks of geo; to be visible on every street corner offering sweetened goo that approximates coffee. Everybody wants to be McDonalds...burgers constructed from who knows what slapped together haphazardly and served rapidly with a huge dollop of sauce and liquid sugar to wash it down. And if we could super-size it, all the better. More more more...because, if we're not visible; if we're not on every street corner and not in everyone's faces, people drive by until they reach the next franchise by someone or some organisation that has a better plot and a better pitch to appeal to the fast-paced consumer with low standards in taste. In many ways it's not even about the taste either. 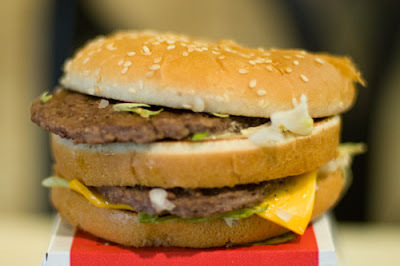 In a taste test there is almost no one who would choose the taste of a fast food burger over a really well crafted burger but crucially, if they have to wait (more than a second), pay (more than a loss leader price) and go out of their way (more than an arm stretch from the car) then it simply becomes not worth it for them. Chef quality is what we might choose but not if we have to work for it so if that's the market place then why would anyone go to the effort to supply anything more than the generic goo? Instant gratification trumps quality every time. We are a generation who are not used to having to work to get anything (I mean really work...hard graft). It is given to us, and don't we deserve it! Haven’t we done well, don’t we work hard, isn’t life tough? No. Not really. To a greater or lesser extent society has become bone idol compared to past generations and this tends to permeate across most of what we do, with laziness comes sloppiness and quality takes a back seat. Give it to us, now…whatever it is and even better if I don't have to move from in front of my computer! It’s not just about being visible and in people’s faces – people gravitate to ‘fast food’ – a quick hit and nothingness and so for those of us who want quality, its tough because it's harder to find. We are competing on an uneven playing field. The same might be said of many sports. Cheating has proven for many to be the path to winning for many high-profile people, and those who tow the line face a lifetime of being second or third, just praying that someone, somewhere will see what is going on and call out the cheat so they have a chance to win on merit. Even when cheats are found out it's their names that persist, not those they beat along the way who are consigned to the "alleys of obscurity, sentenced to rejection in the morass of anonymity" (I always wanted to use that Marillion lyric in something but i digress...). There are too many people who cheat themselves and, along with them, the people who read their maps, and take the fast path with very little thought for the consequences. Sometimes it's done knowingly because they might not care about overcoming a particularly awkward issue and sometimes unwittingly (ignorance is bliss) but short-cutting is a modern curse and a form of cheating. After all, the winners route is always the preferred route for most people which is why band-wagons are routinely jumped upon. The rewards out weigh the risks when taking the shortest path. The taste of fast food out weighs the time and effort for a quality burger…otherwise you are condemning yourself to a lifetime of being second. And who is tough enough to do that? Take peer pressure for instance. Snobbery is often used as a description of those who express taste – lets laugh at the person who knows what wine they like and people who won’t go to a fast food restaurant because they don't like mass-produced food for the masses! “think you are better than that?”, “get you with your fancy restaurants!” etc etc. So why would you want to be castigated for not conforming? Of course people generally want to fit in and be liked in whatever they do. Who wants to stand out and be ridiculed? So the lazy lead the way – set the standard, as low as possible and call out anyone who dares to stand up and say those burgers taste bad and are made of poor quality ingredients. So just as fast food has become the staple diet of the people of many countries because that's how we conform, so perhaps we're seeing mapping going the same way. While I, like many, actually quite like a bit of dirty food once in a while I also like to go to a decent restaurant once in a while. I cook at home from real ingredients as well. The point of this is simple...fast food has become the de facto diet for the majority because the majority rule. Democracy has spoken and the masses have won. Fast maps are becoming the de facto view of the world for many now as well. Because they are ubiquitous. Because they can be made by anyone. Because they are on every street-corner and in every cloud and they provide instant gratification. Amongst all these fast maps are a few decent scraps...some that actually taste pretty good but generally they lack nutrition and the consumer doesn't particularly care because they're not interested in the ingredients anyway. Does the burger taste good? Yep...so eat it and then order another. Does the map look good...well, it seems to (I don't really know, but I guess I trust that it does)...good, well let's consume it with the same lack of interest and then retweet it...or blog about it. Well I don't want my map carto-diet filled with such an imbalance of fast maps and have even more fast maps push out the independent quality purveyors. As a consumer I want choice and I want a better balance to that choice. I don't want the masses to define and dictate what it is that I have to consume. It's incumbent on those of us who have some sort of taste when it comes to cartography to at least offer choice. Yes, taste can be very subjective but the people who I consider have good cartographic taste all tend to agree on many of the values that define decent mapping. Maybe we need a Jamie Oliver of mapping to campaign against Turkey Twizzlers. Show the alternatives and find a platform to get visibility. We need to show people that taking good ingredients and preparing them properly does not have to be costly and can actually produce something more tasty than generic, mass produced processed fast maps. Maybe I veer too much towards the Gordon Ramsay school of criticism sometimes in my slating of stuff (the F word is quite a common expletive when I open up the latest fast map it's true) but at least the guy has passion and a background that suggests he might know a thing or two about decent food. He's also had failures and learnt from them but he holds his standards dear to his heart and won't have some b*llshitter tell him how to cook/run a restaurant. Some of us know some stuff about maps too. I'm not suggesting we should all open high class restaurants but like Oliver and Ramsay in their endeavors to improve food quality and restaurants...get our hands dirty helping others improve and aspire to better things in their own mapping. 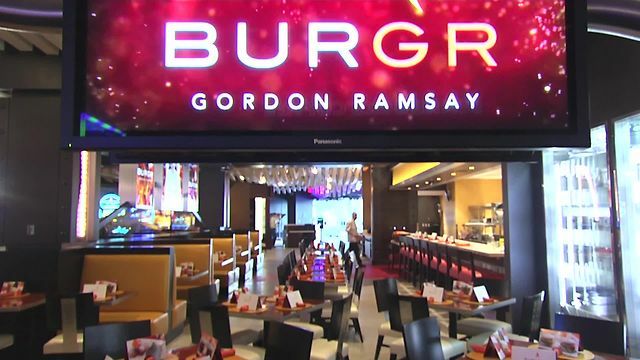 That's a tall order in the current climate but it's worth a shot...and Ramsay has even taken on the burger himself by opening a new restaurant, BurGR, in Las Vegas based around high quality burgers! So let's stop applauding those who peddle fast maps and whose work is re-peddled by those fine purveyors of instant gratification...the blogosphere (Gizmodo, Wired, TechCrunch, your favorite map media outlet or über-blogger). Instead, lets applaud those who choose not to take the easy route and who battle the urge to be as lazy as everyone else. It's inherent in people to take the path of least resistance but sometimes there are those who choose to steer a different path and whose work is all the richer and tastier for it. Only that way will we redress balance in the force and offer people choice and a route to a more healthy carto-diet. You might not want to today...but your body will thank you in 10 years time. In the meantime I'm trying to ensure not every dinner in our household revolves around cartography...and next time I'm in Vegas I'll be trying out Ramsay's new creation. UPDATE: Amongst many positive reactions to my blog post above I got a proper slating by one guy on the Twittersphere for using 'amateurish sociology' to argue for higher standards in cartography. Well, I'm not a professional sociologist so that probably explains that but while there are clearly arguments that we are where we are because of production systems and producers I still maintain much of what we see is driven by demand. Because the demand is not particularly sophisticated, neither is what we get as an end product. Does this stack up? Well for probably over a decade now you can actually make some damn fine maps using desktop GIS. How many people do? Not many. So even when producers do provide the tools the masses make the choice not to invest in whatever it is they need to know/do to take advantage. They also whinge when people demonstrate what can be achieved because it shows up their laziness in not being able to harness what's in front of them. That's what I meant by lazy...path of least resistance. Effort isn't something people are keen to expend. 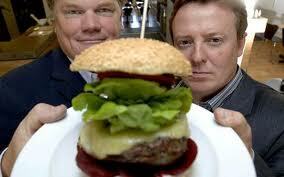 And taste...how can 'doing it right' be regarded as simply subjective difference in 'taste'? When i refer to taste in a cartographic sense I'm not talking about whether we prefer orange or purple line symbols...I'm talking about the basics. Too many simply get the basics wrong. back to the amateurish sociology...if I use salt in a lemon meringue instead of sugar that's plain wrong...it's not simply bad taste. The recipe is wrong. The product will taste bloody awful though it may still look ok. Same with mapping...good cartography occurs when people get their recipes right. Great cartography happens with a spark of something extra...a dash of an ingredient that makes the map shine. Amateurish sociology? Hmm...maybe I was just using basic, one-dimensional ideas because I'm trying to appeal to those who would simply find my ramblings snobbish if i used far more sophisticated arguments. KISS is important. Given the individual claims to be a sociologist perhaps he is just annoyed that I'm operating in his professional domain in this instance? Maybe, then, imagine how professional cartographers feel at everyone else thinking they're nailed the cartographic domain. Dog watching or dog's dinner? Watch_Dogs WeareData alleges to be the first web site to gather publicly available data about Paris, London and Berlin, in one location. They map the data and create a visualisation of the soup we live in. Now I'm not going to be picky...oh, ok, that's the point of the blog! So first off...it's not the first. CityDashboard by my friends at CASA has been around a good while and does a great job. Clean, simple, not over-selling what it does, informative. There are others. So is the new one any good? Buildings are rendered very well with just a hint of outline and shadow to create the illusion of depth on a sphere from the central focal point. As you zoom in we increasingly move away from planimetric to a 3D panoramic view. The landscape gets a carbon fibre style treatment and we have building walls in transparent gradient fills. Very few names though and at large scale we need labels to determine where we are. Buildings aren't clickable. More labels would help. Is there too much going on? 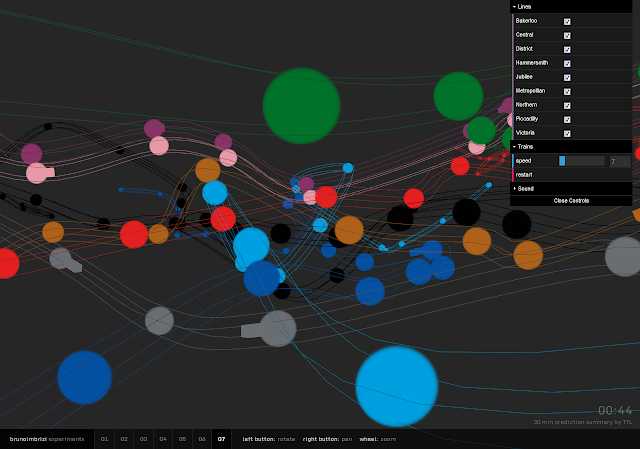 There's movement, interaction and a lot of data being displayed. Note I said data...but with a quick click we can reveal information for some data types for instance down to the one-thousandth of a second until a particular tube train arrives at the next station. Really? Does publicly available data really give us accuracy down to that degree of precision? Once you click on a moving train symbol though, the train becomes the centre of the map which pans to its destination...nice touch. As you click other objects (e.g. CCTV camera symbols) and a Bladerunner style set of lines appears, shudders and then persists, glowing. What? Are the cameras connected? Why can't I see a web stream? What is this connectivity showing? Mobile cellphone masts are similarly clickable and seemingly connected. But in reality they're not are they? Neither are ATMs or any other class of object other than purely as a map category. Boris Bikes are symbolised with a green circle and give details on the number of bikes available but why not use the proper symbols? Yes, I know...copyright, but geometric shapes lose much of the power of mapping when common objects are mapped. Same for the London Underground stations. Some symbols are so engrained; so ubiquitous that seeing new representations is awkward and unfamiliar. Traffic lights are included but...why? There's no roads mapped (though some road labels are visible) and no data associated with the lights. There's no information on traffic problems, accidents, heavy traffic or anything like that. If we could control them then maybe it would be fun but this is an example of mapping data because they managed to acquire/scrape it rather than having a purpose to mapping it. What are the green polygons? Parkland? Again...not clickable and only a knowledge of the real world enables you to figure out what you're seeing. Then we have the standard social media feeds...tweets, instagram, foursquare, Flickr. Really. Isn't this all getting a bit tiresome? I clicked one instagram post and saw a picture of an empty bowl of sweets. In the context of the city...what precisely is this telling me? Maybe that Rasheeb has run out of Quality Street? That's all. Nothing more. Pointless noise. With all the nice geographically accurate buildings why do we have a stylised Underground network? Straight lines connecting stations? I'll tell you why...because that's how the data exists from the source used. But it jars, visually. We get area stats that include a latitude, longitude to 6 decimal places...for an area? Where in the area? Many of the data fields are blank for some areas. Others appear static such as electricity consumption....oh, they are static...it's the average consumption for an entire year. So we have tube trains position reported to thousandths of a second and electricity consumption for a huge area of a city averaged over a year. How is any of this comparable temporally when presented on the same map? Heck it even has audio. Stick your headphones on and you're immediately in the trash compactor scene in Star Wars Episode IV...no, wait...there's some trancy music. It IS Bladerunner! I could go on but you get the gist. 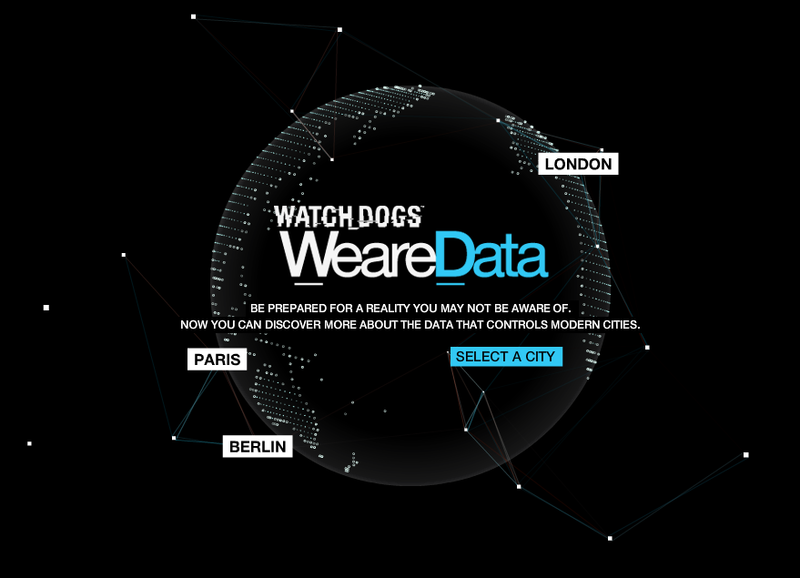 Apparently we can "discover more about the data that controls modern cities". Oh really? I hate to break this to you but you actually can't. Visual eye candy but beyond that, this is a random collection of data sets thrown on a map loosely and with no sense of purpose. What does it show? It uses a rainbow colour palette that doesn't quite cover the basemap. It has a load of dot symbols of varying, equally bright colours. Some of the dots have a halo symbol behind them. Some of these halos exist without other overlying dots. Did someone spill a packet of Skittles on the map? Should it be titled 'a rainbow of fruit flavours'? I have no idea what this map shows (sorry!). Answers on a postcard? Dot density mapping seems to be the new hexagon in mapping. 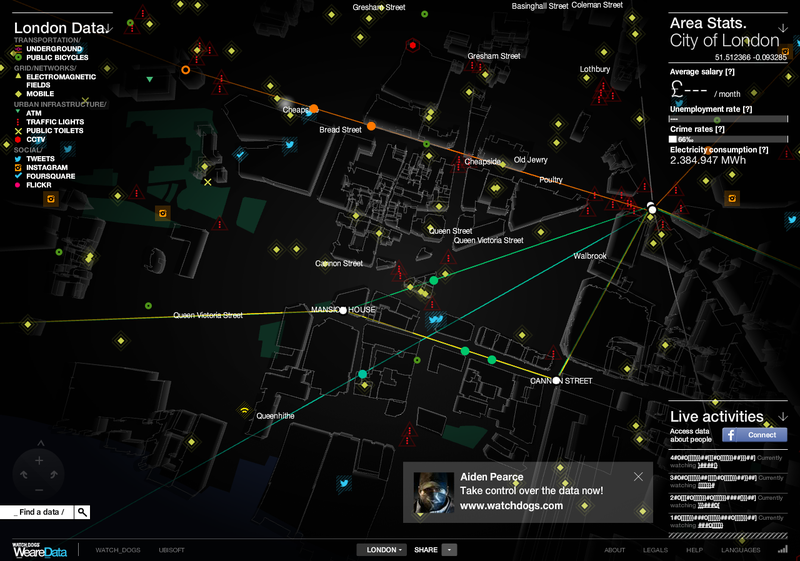 We've seen iPhone vs Android neighbourhoods, locals vs tourists and languages mapped. The US census has been mapped as one dot per person. I had a bash at mapping the results of the 2012 Presidential election. There's plenty of others and Eric Fischer writes a nice discussion on some of the issues you have to contend with when making such maps (picking up some threads of a discussion I had with him after my previous blog). And then we have The Guardian's "Every person in England and Wales on a map". There isn't much information about the map's construction except each person in England and Wales has been represented with a dot. The data source is the 2011 census. That equates to 56,075,912 dots on the map. At it's proper size this is the maximum scale which is 1:72,224. I struggle to see individual dots. The reason is simple...the dots are too large so in the areas of most people they are coalescing into an amorphous blob. 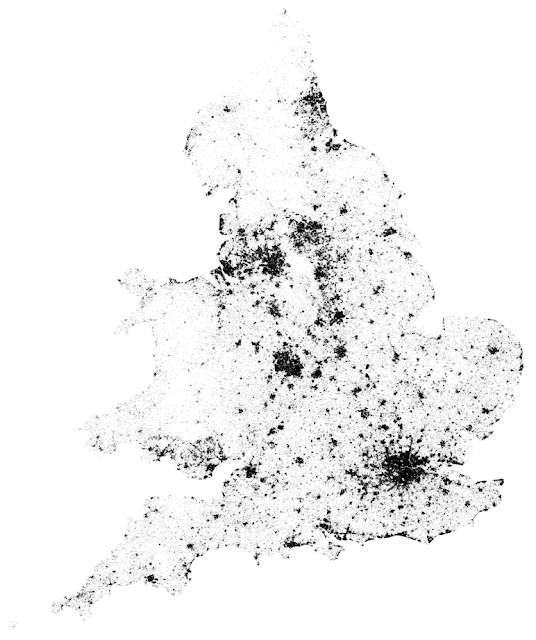 We have no way of seeing any variation amongst the most densely populated areas. All we get is a black fill for the underlying polygons. This also creates the illusion of 'totality' in the sense that the area is absolutely rammed with people to the point of there being no room left for anyone else (is this the political point the map maker wanted to make?). Black is never a good colour to use on a map for 'fills'. Leave it for linework and labels....or make your dots sufficiently small so we can see some detail in these areas. 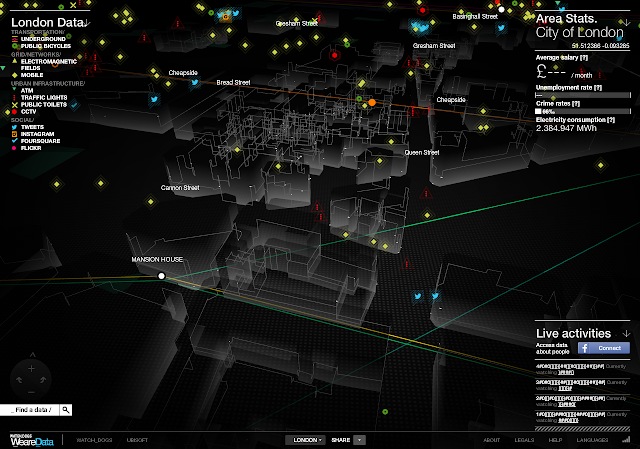 The map above clearly shows that the data has been mapped into boundaries. These look like wards...the primary unit of English and Welsh electoral geography. It's not the finest scale of geography and it's conceivable they've used data reported at sub-units (e.g. Output Areas). And so the dots are placed randomly within the areas. That's a fairly standard technique for dot density mapping but let's not get carried away. This does not create a picture of population density. Using wards or other arbitrary boundaries means the data is constrained by the pattern that those boundaries create and NOT the pattern of where people live. So I don't find this a beautiful picture of population across England and Wales; I find it a visual misrepresentation of that statement. The standard technique for mapping census data in wards is a choropleth map which, through the use of graduated colours, would allow us to compare the population density of areas across the country. It might be considered a 'boring' technique, particularly for the media, but it would be useful in this context. Instead we've got randomly placed dots across the entire country including all those areas only populated by parkland...or airports...or reservoirs and lakes...or sheep..or well, the map suggests that people exhaust space but in different densities. People don't. In fact, many areas on the map will have far lower densities (practicaly zero) and many areas will actually be far more populated. Whenever people look at dot maps, particularly those that suggest each dot is an individual data item (person in this case) the presumption is that the dot is the actual location. The danger of imputing the characteristics of an area to a finer resolution of data is termed the ecological fallacy and this is manifest in The Guardian's map. They've taken data reported in areas and created a map that at least 'suggests' a finer scale of mapping than the data is capable of providing. At best we know there are a lot of people in one area compared to another but the map suggests people are everywhere. The arbitrary boundaries of wards create the pattern we see, not the populated surface. The map really should use a dasymetric technique which takes into account a secondary data set that allows us to position the source data more in line with where we logically know the data exists. In this case, using urban land use would help. Using residential land use (because that's where the census reports location) would be even better. Additionally, mask out all the parks, airports and unpopulated areas and THEN use the dot density technique to distribute the dots in those new areas. That's the technique I used for the dasymetric dot density map of the 2012 Presidential election data. I also avoided the ecological fallacy by deliberately NOT using 1 dot to symbolize 1 vote because I have no idea of voting patterns at that scale. I left it at 1 dot is 10 votes. I perhaps stretched things even then and maybe should have left it at 1 dot is 100 votes. Either way...the map shouldn't suggest more than the data is capable of showing. The point here (no pun intended) is that accurate mapping requires quite a bit of data processing. It requires thought and, often, further data than simply the item to be mapped. It requires a knowledge and understanding of what you're doing and the limitations inherent in the technique and how you're crow-barring the data into it.